Torino will be expected to get the points on Friday night as they host struggling Frosinone, but must improve in front of goal. The Granata made hard work out of beating Chievo away last weekend and had to rely on substitute Simone Zaza to stab home the winner late on in the game. That ended a three-match winless streak that had run since a 1-0 victory at home over SPAL at the start of September. The problems are in attack, where four goals in their last five games is a poor return for Walter Mazzarri’s men. Argentine full-back Cristian Ansaldi has been out long term and Brazilian defender Lyanco joins him on the treatment table, while Lorenzo De Silvestre will face a late fitness test ahead of this game. The Canarini meanwhile have lost five in a row and have just one point to show for their endeavours so far this season. That came in a goalless draw at home to Bologna and it has been that lack of sharpness in front of goal that has been the real glaring problem for the newly-promoted side this season. Frosinone have been abysmal since returning to Serie A and their sole goal scored this season was a penalty tucked away by Camillo Ciano in last week’s 2-1 home loss to Genoa. Their Coach Moreno Longo will be praying his side gets something out of this game and he can get into the upcoming internationals still in his job. He desperately needs that extra time to work on the training field in an attempt to improve his team and somehow get them scoring. Longo will have to do without the services of strikers Luca Paganini, Daniele Ciofani and Federico Dionisi, who are all long-term injury absentees. Midfielders Mirko Gori and Raffaele Maiello are also struggling to be fit. Torino have won two of their last three home games against Frosinone, losing once in 2010 in Serie B.
Cagliari and Bologna have won Serie A titles in their history, but it looks like another desperate scramble to avoid relegation. Only one point separates the two sides going into this early Saturday kick-off, as Bologna managed two wins and a draw, while the Sardinians scraped one victory and three stalemates. Pippo Inzaghi had an abysmal start to his Stadio Dall’Ara career, failing to score a single goal in the opening four rounds, but seems to be finding his feet with two wins in the last three games. Those were victories over Roma and Udinese, so impressive scalps, with the lone defeat in that run coming against unstoppable Juventus. Cagliari have not found the net in their last three outings, in which they lost to Parma and Inter while thanking goalkeeper Alessio Cragno for a stoppage-time penalty save for a point against Sampdoria. Although Rolando Maran’s men surprisingly beat Atalanta and held Milan to a 1-1 draw, they seem to perform better when up against the odds than with a fellow minnow. Luca Ceppitelli and Charalampos Lykogiannis are out injured, with Artur Ionita battling Joao Pedro for the trequartista role behind strikers Leonardo Pavoletti and Marco Sau. Bologna continue to do without Rodrigo Palacio, Filip Helander and Godfred Donsah, while Andrea Poli faces a fitness test after missing last week’s Udinese game. They had been trailing 1-0 before Federico Santander scored one and helped set up another for Riccardo Orsolini to turn it around. Bologna are unbeaten against Cagliari since a 1-0 result in Sardinia in October 2012, managing four straight wins followed by three consecutive draws. Juventus have a 100 per cent record in all competition this season and expect to maintain it in Udine. The hosts have been mediocre so far this season. They currently sit 14th in the table and only managed to grab three points out of a possible nine in the past week, losing two on the bounce. Udinese took the lead in their last match against Bologna but were unable to come away with the win after conceding a late winner from youngster Riccardo Orsolini, who is on loan from Juventus. Midfielder Rodrigo De Paul, however, has been the biggest positive for Le Zebrette this season. De Paul has four goals and three assists in seven matches and has been by far the best player in Julio Velazquez’s side. His performance this Saturday, in addition to whether or not Kevin Lasagna can show up, will be crucial in Udinese’s attempt to come away with a result. Juventus went down early when they hosted Napoli, but they did well to claw back and grab a massive three points at home against arguably their biggest challenger for the Serie A title this season. Paulo Dybala bagged a hat-trick against Young Boys in the Champions League on Tuesday and will want to ride that newfound wave of confidence. Sami Khedira and Daniele Rugani have joined the injury list with Leonardo Spinazzola and Mattia De Sciglio, but Giorgio Chiellini and Joao Cancelo return after being rested in Europe. Emre Can gets the chance to shine in midfield. Udinese ended Juve’s 47-game unbeaten home streak in the 2015-16 season opener. After losing to Parma last week, Empoli continue their relegation battle on Saturday, when they host the rejuvenated Roma. Despite shining so brightly and scoring the astonishing 88 goals in Serie B last season, at the moment Empoli look like a team in trouble. Aurelio Andreazzoli’s men won their Serie A opener against Cagliari, but they have scored just three goals and are on a six-game winless streak. To make things even worse for the Azzurri, they are set to face Roma, who seem to be finding their shape and have won their last three games. The Giallorossi will be full of confidence, as they have scored 12 goals during this stretch, which included a 4-0 win against Frosinone, a 3-1 victory against Lazio in the Derby della Capitale and a 5-0 thrashing of Viktoria Plzen in the Champions League on Tuesday. Roma’s defence is a long way off being impressive at the moment, but Eusebio Di Francesco’s new 4-2-3-1 formation seems to be giving his backline more protection. This is mainly due to Steven Nzonzi and Daniele De Rossi’s presence in front of the defence, which not only provides a formidable physical presence in the middle of the pitch, but also allows the likes of Cengiz Under, Stephan El Shaarawy and Lorenzo Pellegrini, who continues to impress in his more advanced role, to focus on their attacking duties. All of the aforementioned players are expected to start behind Dzeko against Empoli, so the hosts will need a strong defensive display in order to put Roma’s winning streak to an end. The visitors will be full of confidence and will try to put the Azzurri under pressure right from the start, which might force Empoli to abandon their preferred attacking style, sit back and wait for chances on the break. Luca Antonelli, Lorenzo Polvani and Manuel Pasqual are all injured, which means that Andreazzoli will be short of options in defence, while Afriyie Acquah’s absence will deprive the hosts from much needed physicality in midfield. On the other hand Roma will be without their injured pair of Argentinians, as Diego Perotti and Javier Pastore will both miss the game. Roma are undefeated in their last nine meetings with Empoli. The Giallorossi have registered five wins and four draws against the Azzurri. Sunday’s early kick-off sees two of the form sides in Italy go head-to-head, as Genoa host Parma at the Stadio Luigi Ferraris. Genoa come into this game sitting pretty in sixth place with a game in hand, whilst Parma have settled back into life in the top flight nicely, currently occupying 10th place. Genoa’s Krzysztof Piatek has been making headlines all week after setting a new league record following his seventh and eight goals of the season at Frosinone last weekend and poses a real threat for the Parma defence. Having said that, Parma have not looked out of place back in Serie A after their time away and in Gervinho also carry a threat going forward. Roberto D’Aversa’s men have won three of their last five matches after opening the league campaign with one draw and one defeat. Those two defeats came at the hands of the current top two, Juventus and Napoli, and have already shocked Inter this season, so will be confident they can take something from this game. Genoa, a side from Piatek, have only scored three goals, so Parma will know if they can control him, they stand a good chance of a positive result. The Rossoblu have conceded just the one goal at home so far this season, however, and have proved a difficult side to beat. Parma also boast a more than decent defensive record so far this season, conceding just the eight goals from their seven games and have won their three matches with clean sheets. You would expect Parma to allow Genoa to control possession, but the hosts will be wary of the threat their opponents possess on the counter-attack, so this could be a case of both defences proving to be the main factor. Parma haven’t beaten Genoa since a 3-1 Tardini result in October 2011, followed by four draws and three defeats. Atalanta and Sampdoria go head-to-head for Europa League ambitions with Duvan Zapata eager to surprise his former club. In recent seasons both clubs have compiled impressive campaigns through clever navigation of the transfer market and excellent coaching. After securing fourth and seventh place in the last two seasons respectively, Gian Piero Gasperini would be incredibly disappointed and a little bit bemused to see his Bergamo-based club languishing in 17th place with six points after seven games. The hosts have had their fair share of tough fixtures, such as away trips to Roma, Milan and Fiorentina, but defeat to Cagliari and drawing to Torino at home have been surprising to say the least. Marco Giampaolo’s Sampdoria continue to be as much as an enigma as they were last season. The Blucerchiati currently reside in eighth place with 11 points from seven games. It’s a good tally considering they’ve already taken five points from Napoli, Fiorentina and Inter, but slip-ups against Cagliari and Udinese confirm their poor away record. Both sides enjoy their fair share of possession, but you can expect Atalanta to dictate play from the start. Midfield pairing Marten de Roon and Remo Freuler haven’t been as reliable defensively this season as they were previously, Freuler in particular. If Atalanta, who have the seventh worst defence in Serie A, want to keep Gregoire Defrel and Fabio Quagliarella quiet, they’ll have to stop the likes of Gianluca Caprari and Dennis Praet from getting the ball to them. However, one potentially defining feature of the game may be Sampdoria’s defence. Giampaolo looks to have improved upon the 60 goals conceded last term with just four this season. It could only take a bit of magic to put Sampdoria past Atalanta and then they can hold out for the rest of the game. Atalanta expect to have a fully fit squad aside from Marco Varnier, who’s out with a long-term injury. For Sampdoria, Lorenzo Tonelli is expected to be fit enough to start at centre-back, whilst Gaston Ramirez is an injury concern and will probably only make the bench. Riccardo Saponara and Vasco Regini are out of action. Samp have lost only one of their last five meetings with Atalanta, 1-0 in Bergamo in January 2017, along with three wins and a draw. 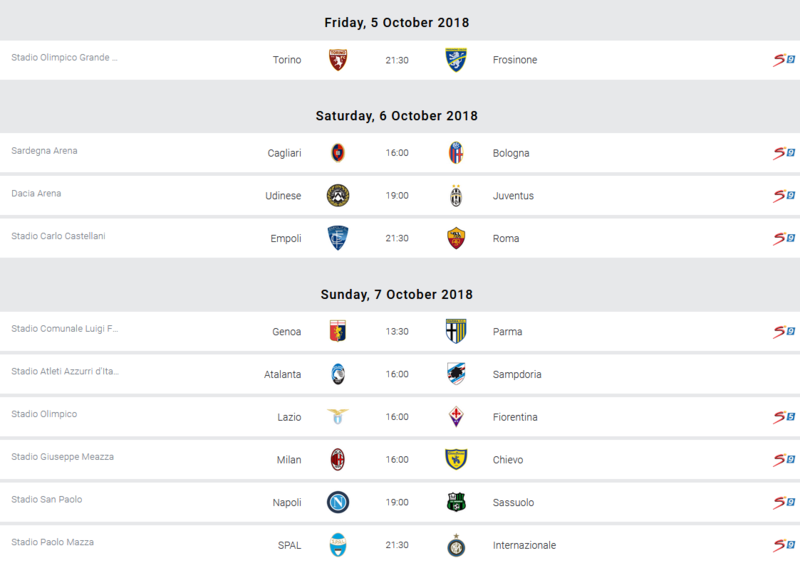 Lazio’s nightmare week could get even worse, as they host a fired-up Fiorentina side in a head-to-head for third place. The Aquile are looking to bounce back after a five-game winning streak crashed quite spectacularly to a halt. They lost 3-1 in the Derby Della Capitale to Lorenzo Pellegrini-inspired Roma. They were also humiliated on Thursday night away to Einhart Frankfurt in the Europa League, when Dusan Basta and Joaquin Correa were sent off in a 4-1 loss. The Biancocelesti will be eager to get back to winning form and ultimately press for a European spot. Lazio will also be hoping to find other avenues for their goals, as Ciro Immobile is the only Aquile player to have scored more than twice this season. Although having lost their past two fixtures, Simone Inzaghi is expected to go into this game relatively unchanged. Jordan Lukaku is the only injury for Lazio as he is still 20 days away with a knee injury. Meanwhile, La Viola are flying in the new campaign. They are currently equal third with Inter and Sassuolo, and a win here would all but secure a top four spot going into next week’s international break. They come off the back of a controversial 2-0 win at home to Atalanta last week thanks to a Jordan Veretout penalty and a splendid Cristiano Biraghi free-kick. Stefano Pioli’s men will be confident going into this match, however as shown by their previous three meetings with Lazio at the Olimpico, this is a very tricky tie. Fiorentina have the second-best defensive record in the league, conceding just four goals so far this season and are sure to frustrate a less-than-impressive thus far Lazio attack. Unlike his counterpart, Pioli is widely tipped to name an unchanged side for this weekend’s game. They are currently injury-free, so he has a clean bill of health to choose from on Sunday. Fiorentina have only defeated Lazio once in their past six competitive meetings at the Stadio Olimpico, losing three and drawing two. The lone victory was 4-2 in May 2016. Milan are back in business after morale-boosting victories over Sassuolo and Olympiacos, but Chievo remain rock bottom. The Rossoneri went through their rough patch and emerged like a phoenix from the flames at the Mapei Stadium, beating the surprise outfit of the season so far 4-1 on their own turf. The fact they achieved this without Gonzalo Higuain or indeed any recognisable strikers in the starting XI further boosted confidence throughout the squad. Pipita was back from his injury for Thursday’s Europa League match with Olympiacos and made his mark in a comeback to win 3-1, although it was substitutes Patrick Cutrone (a brace) and Hakan Calhanoglu (two assists) who changed that game. Cutrone is still not 100 per cent fit after an ankle injury last month, so we’ll have to wait a while before seeing the dream partnership with Higuain from the start. Franck Kessie, Mateo Musacchio and Ignazio Abate were rested in the Europa League, while Mattia Caldara, Andrea Conti and Ivan Strinic are still out of action. Diego Laxalt could step in to give Ricardo Rodriguez the day off, with Abate and Davide Calabria tussling for a spot. Chievo are in crisis and not just because they were docked three points for false accounting. Coach Lorenzo D’Anna was promoted from the Primavera youth team towards the end of last season to rescue the side from relegation, but is starting to look somewhat out of his depth. Losing Roberto Inglese over the summer has also been a huge blow, although Mariusz Stepinski has contributed two goals in seven games. Emanuele Giaccherini is comfortably their most creative player and he is expected to miss this match through injury, along with Nenad Tomovic, Filip Djordjevic and possibly also Fabrizio Cacciatore. Valter Birsa and Mehdi Leris could get the supporting roles behind Stepinski instead. Chievo have never won away to Milan, managing just two draws in 16 top flight attempts. The most recent was 2-2 in March 2004, with Lorenzo D’Anna and Gennaro Gattuso facing off on the field. Napoli are buzzing again after a Champions League triumph over Liverpool, but Sassuolo are only two points behind them. A week is a long time in football, and that’s certainly the case for Napoli. Last Saturday they traveled to Turin and lost to title rivals Juventus despite taking the lead, but in midweek taught Jurgen Klopp’s Liverpool a lesson in the Champions League with a very impressive 1-0 victory. Sassuolo know the feeling, as they went from the possibility of leapfrogging Napoli into second place to a thumping 4-1 home defeat to Milan. With two points between them, this could prove to be a pivotal moment in not only how the respective seasons of these two clubs could pan out, but also how far Sassuolo have come since their good start and whether they can seriously keep up a European challenge. Napoli under Carlo Ancelotti have started the season with some good wins against Lazio and Milan, but a comprehensive loss to Sampdoria in Week 3 spawned the change from the original 4-3-3 formation to 4-4-2. In terms of Serie A, just the loss against Juventus is the only other hiccup in their form, which does stand them in good stead against a Sassuolo side who, it’s safe to say, have surprised a few people already. Four wins from their first seven Serie A games meant that Sassuolo are sitting in joint third place, level on points with Inter and Fiorentina, and could leapfrog Napoli if they can win at the San Paolo. The only Sassuolo victory in 10 meetings was 3-1 at the Mapei Stadium in August 2015, along with four draws and five defeats. Inter Milan will look to continue their recent good form when they travel to the Stadio Paolo Mazza for a Serie A clash against SPAL. The visitors have looked imperious in their recent matches and should claim all three points on Sunday. The White-Blues are coming off a 2-1 defeat away to Sampdoria in their previous fixture in the league. They took a first half lead through Alberto Paloschi but could not hold on and conceded two goals either side of the break. Leonardo Semplici’s team have had a decent campaign in the Seria A so far having claimed three wins from their opening seven matches. However, they have lost the remaining four fixtures and are sitting 13th on the table. The Nerazzurri secured a 2-0 victory over Cagliari in their previous league fixture last Saturday. Matteo Politano and Lautaro Martinez got the goals for Luciano Spalletti’s team as they moved to 4th on the table. Inter have been in fantastic form in recent weeks having won their last five matches. Their good form has been extended to the Champions League as they have won their opening two fixtures in the competition, including a 2-1 win away at PSV on Wednesday. Mauro Icardi was an unused substitute last Saturday and should return to the team after scoring in the Champions League on Wednesday. Politano is also likely to start and will be looking to build on his goal against Cagliari. There have been only two previous matches involving SPAL and Inter Milan with both teams facing each other twice in the league last season. Inter claimed a 2-0 win at the San Siro before settling for a 1-1 draw in the reverse fixture.